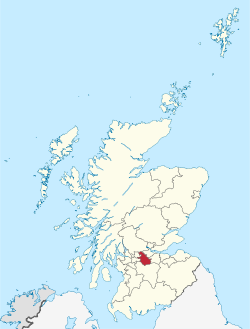 North Lanarkshire Scottish Gaelic: Siorrachd Lannraig a Tuath) is one of 32 council areas of Scotland. It borders onto the northeast of the City of Glasgow and contains many of Glasgow's suburbs and commuter towns and villages. It also borders East Dunbartonshire, Falkirk, Stirling, South Lanarkshire and West Lothian. The council covers parts of the traditional counties of Dunbartonshire, Lanarkshire and Stirlingshire. The area was formed in 1996, largely made up from the Cumbernauld and Kilsyth, Motherwell and parts from the former Monklands District Council (1975–1996) as well as significant elements of Strathclyde Regional Council. ^ "2017 Wards: Boundaries, population and household numbers". 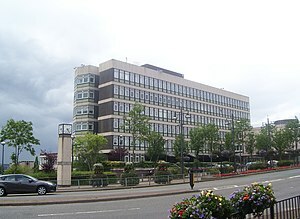 North Lanarkshire Council. 2018. Retrieved 8 February 2019. ^ "North Lanarkshire Council -". mars.northlanarkshire.gov.uk.